The inspiration for this pizza came from a dish of grilled shrimp my son made over the summer. It was spicy and served on corn tortillas and I did not have 100% of the effort involved in making it so of course it was good! He got the recipe out of a cookbook at our library--one of our family summer reading activities. We re-created it alongside cornbread in the fall. When I had leftover cooked shrimp from our New Year's Ever Appetizerpalooza [not to be confused with #AppetizerWeek, that's next week] I decided to try shrimp on a pizza. 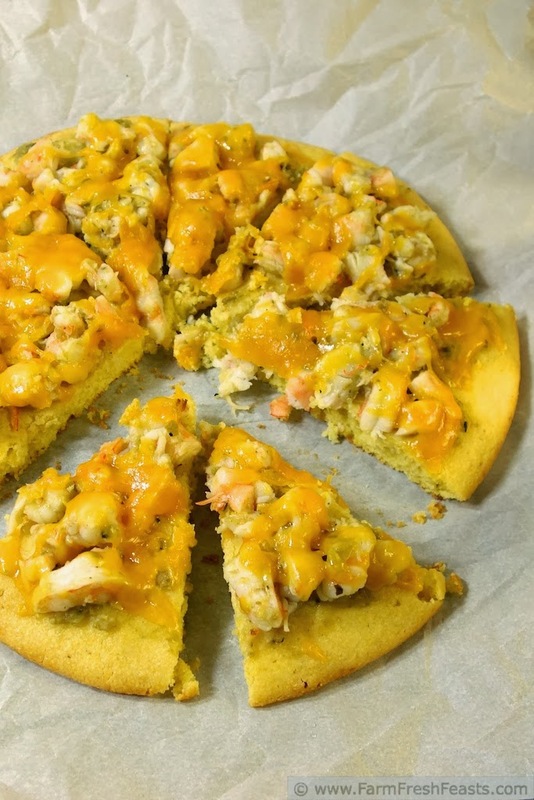 This is not my first shrimp recipe--I snuck a Roasted Shrimp, Celery, Grape, and Potato Salad in here last fall--nor is this my first seafood pizza. 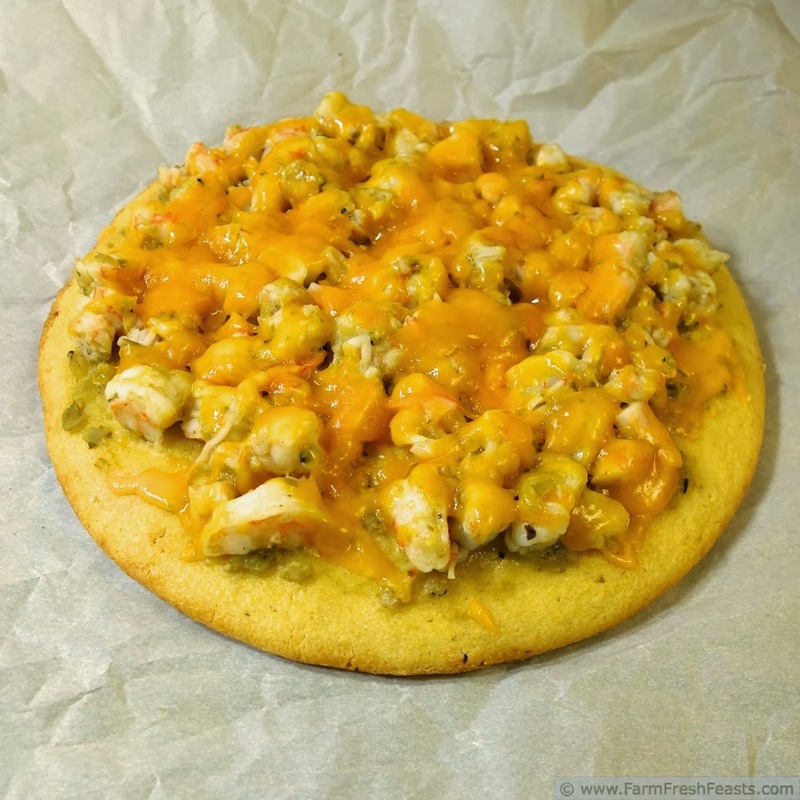 Check out my Visual Pizza Recipe Index or the links at the bottom for additional seafood pizzas for your Friday Night Pizza Night. Even though this wasn't my first rodeo, this recipe was not without dithering. I was torn, trying to think of a way to duplicate a grits crust. Or even a cornmeal crust. Finally I just decided to Keep It Simple. Keep It Simple, Sillybilly (KISS) is the title of one of my early blog posts before I clued in to making a recipe more searchable by using the actual recipe name in the title. Revolutionary! KISS is a recipe post for Beau Monde dip, another vehicle to transfer Community Supported Agriculture (CSA) farm share vegetables into my mouth--and those of my family. What could be more simple than taking my tried and true cornbread recipe and baking it in a 10 inch skillet instead of my usual 7 inch skillet? Perfect. The thickness is less than a deep dish pizza, but more substantial than a thin crust pizza. You can eat this with a fork, or pick it up with your hands. With precooked shrimp, pre baked cornbread, and put up (or store bought) salsa verde, this pizza assembles and bakes very quickly. Perfect for a last minute pizza or easily one where you don't have yeast or don't feel like fussing with dough. Mix it up, pour it in, bake, prep the toppings, top, and go. Preheat oven, and a 10 inch cast iron skillet (in a pinch, 8 or 12 inch would also work, but you'll need to adjust the initial baking time), to 400 degrees Fahrenheit. Pour a generous splash (1 to 2 teaspoons) of cooking oil into the hot skillet and preheat that in the oven until shimmery. In a large bowl, whisk together egg, oil, and milk. Dump on top the flour, cornmeal, baking powder and salt then whisk together until combined. Pour into the preheated skillet. Bake for 20 minutes until top is lightly browned. While the cornbread is baking, combine ¼ cup salsa verde with the chopped shrimp. Set aside. Remove the cornbread from the oven and place on a piece of parchment paper. Increase oven temperature to 425 degrees Fahrenheit. Spread ½ cup salsa verde across cornbread. Top with spiced shrimp and cheese. Bake for 5 to 8 minutes until cheese is melted. Cool slightly, then slice (Amazon affiliate link to my favorite slicer) and serve. Impressive my friend. 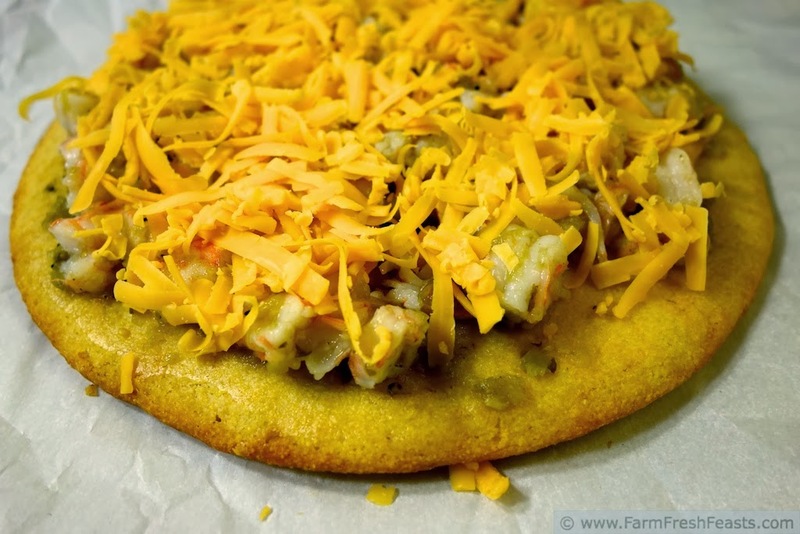 I would love to try a cornbread crust pizza. I'd probably top mine with some three bean chili. Yum. Kirsten, this is a wonderful idea. 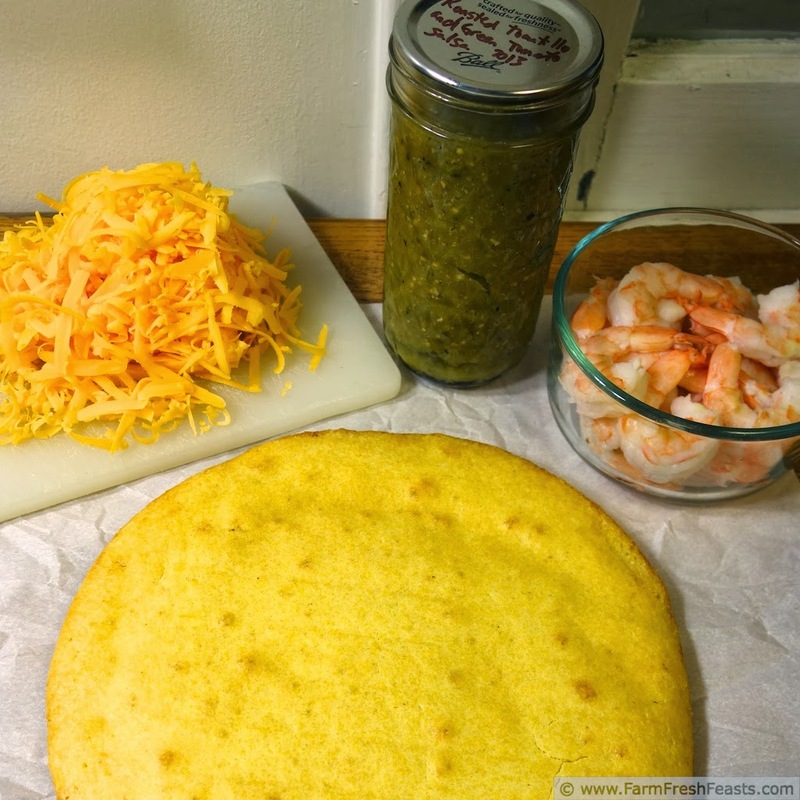 I love the idea of making a cornbread crust, and how delicious that must be with the shrimp! I'm also very jealous of your big jar of salsa verde, since our tomato crop was not great last year, and I never got around to making my green tomato salsa. We have been missing it all winter. I'll be giving this pizza a try for sure! I wish I could have shared some of my tomato crop--I ended up making one batch of salsa verde with half tomatillos and half green tomatoes because I had so many tomatoes to use (and not enough tomatillos for my Hatch chiles). It seemed like I was canning tomatoes every weekend or every other weekend in the fall. I can look back now and be glad . . .
though at the time . . .
Wow, you have quite the trove of pizza recipes! 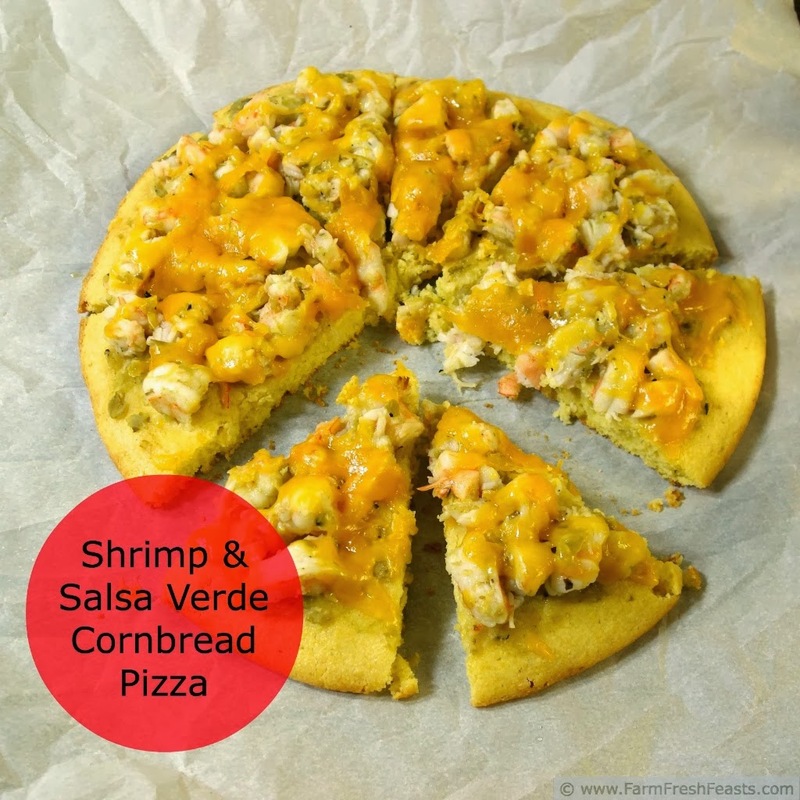 I love both the idea of the cornbread crust and the shrimp and salsa verde topping, nice work! I appreciate your kind comments! I admit last Friday I just made a plain pepperoni & pickled pepper pizza, nothing fancy with sauce or crust or cheese, and didn't take a photo of it and it was just . . . . a nice break. I'm glad to have a recipe index of ideas, though I'm also glad to have an old familiar standby. You just blew. my. mind. ...I would never have thought to use cornbread as the crust - and it's one of my favorite things to eat!! You can sure as heck bet I'll be using this in the future though! And salsa verde??? I love everything about this pizza. I'm glad to inspire you. My mom reminded me of my flour-less cornbread recipe so I'll tackle that one next. I'm loving the cornbread crust! You make the best pizzas! Thanks for linking up with What's Cookin' Wednesday! There are times when my whole family would agree with your assessment.